Glen's post on PLNs and peer collaboration, details how he and Alexavier Fareheed made the journey from tweets to emails to collaboratively authoring their book, 'Beyond the Mean', using Google Docs in just 10 days. This post chimed very strongly with an idea I'd discussed in the past with Physics teaching members of my twitter PLN - given dwindling school budgets, and the inherent flaws of static printed texts about fields which are continually developing; why don't we just write our own 'virtual' textbooks? 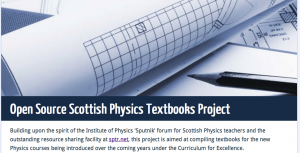 For about 6 years I've been a subscriber to Scotland's largest and most vibrant subject-based email forum for teachers - The Institute of Physics 'SPUTNIK' . The forum has over 600 members from about 900 physics teachers in Scotland, and on a typical day may have 20 or more posts with members sharing links, seeking help, floating ideas and debating the issues of the day. A recurring topic on SPUTNIK has been the new certificate courses coming on stream over the next few years as Curriculum for Excellence progresses, for which details have been released, bit by bit, from our examination board, the SQA. 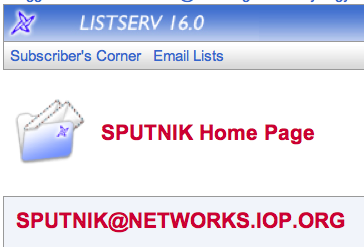 In conjunction with SPUTNIK, our community is fortunate to have its own dedicated website for storing and sharing resources - SPTR.NET - which was set up and is curated by the mysterious Magic Physics Pixies. The Physics community has made a great deal of use of this, with many benefitting from those generous members making their materials for new CfE units of work and the new Higher Physics course available to everyone. After reading Glen's post last week, I posted a short message on SPUTNIK, floating the idea of using a similar approach to producing texts for the new National 4, National 5, Higher and Advanced Higher courses. There were a few positive responses, but nobody seemed to be 'biting'. Being a bit busy with prelims and coursework for a few days, I wasn't able to do anything more with the idea until this week, when I decided to use Google Forms to canvas opinion on the idea a bit further and get a few folk to sign up to contribute. It's early days yet, but about 20 people have signed up to contribute in the first few days. Hopefully we can gather enough people to get things organised next term and start writing in the summer holidays. As there are 4 courses, each with three units this would need about 60 people to make it work, but that'll be a big task for all involved. However, given the fully collaborative nature of the Google Docs platform, potentially every contributor could contribute to every one of the documents, allowing proof-reading and editing to be done by everyone. That's not to say it won't need to be structured or have lots of contributors to get the coverage, but the flexibility and fluidity afforded by this approach may just be the defining factor in its success. I hope. Once enough people are on board to make the project viable, it should be possible to make the 'textbooks' available in a variety of formats - website, wiki, even a paper volume via a service like lulu.com if there is demand. Now to drum up some more interest, and think about some ground rules. Any and all ideas, comments and criticisms on this project are welcome and would be gratefully received.